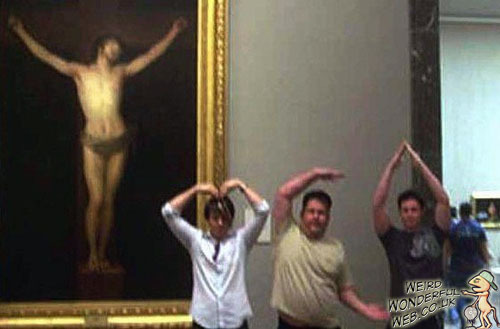 Jesus unknowingly joins in with the Y.M.C.A. dance at this art gallery. The celebration of the birth of our lord Jesus Christ. Oops I mean Christmas work parties where everyone drinks too much, makes that inappropriate move on their work colleague and dance to all the cheesy disco classics. Especially Y.M.C.A. This picture above quite conveniently combines the two. Labels: Art , Christmas , Jesus Christ , religion , weird images , Y.M.C.A.